Getting yourself out of debt is not an easy thing. Once you’ve done it, you never want to be in that position again. In fact, many of us become so afraid of going back into debt that we limit ourselves by refusing to own credit cards or take out loans. That’s not necessarily the financially smart way to move forward with your finances. Instead, you just need to take smart actions to keep bad debt at bay. It’s important to realize that not all debt is bad. Manageable debt that allows you to get a step ahead in life can actually be a good thing. Great examples include college education loans and real estate investment loans. You can maximize your good debt opportunities by learning how to keep bad debt away. Bad debt is any unmanageable, high-interest debt that is used to get items that don’t benefit you in the long run. 1. Make a list of your life goals. Before taking on any debt, ask yourself if the debt can aid you in your life goals. If not, don’t accept the debt. 2. Deal with your fear of debt. If you’ve been in debt then you may be afraid of using credit cards or taking out loans because you may get trapped back in debt. This fear of debt may actually make you more prone to debt problems in the future because you aren’t learning how to appropriately deal with debt. You’re just avoiding it. Journal through it or work with a psychologist to really get a realistic understanding of your debt fears. 3. Use one great rewards credit card. Having too many credit cards makes it too easy for debt to come back. Choose your favorite, most rewarding card. 4. Always pay your credit card bill in full each month. Credit card debt is almost never good debt. Pay it off immediately to avoid bad debt situations from creeping back into your life. 5. Post a list of all of the credit card transactions that you’re making. This list needs to be in the car or at your desk – some place that you’ll see it daily. 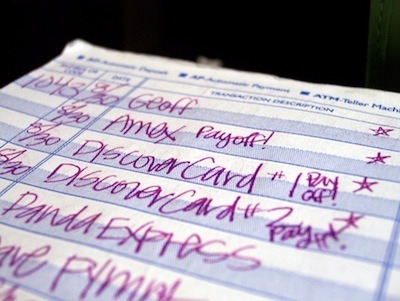 Add a note to it every time that you use your credit card. This will help you limit use to what you can actually afford to pay off so that you don’t accrue credit card debt. 6. Ignore all of those credit card cash advance checks. Don’t even open them when they come into your mailbox. Tear them up. 7. When debt seems unavoidable, explore payment plan options. There are some occasions when you need to take on debt. For example, if you get strapped with an unexpected large medical bill. Don’t reach for your credit card right away, though. Ask the service provider if there is any way to get on a payment plan. These are often no-interest plans that allow you to quickly repay the debt without incurring a debt problem with a third party provider like a credit card company. 8. Build up an emergency fund. This will prevent debt from unexpected expenses in the future. 9. Get educated about debt options. There are many different types of debt including home loans, home equity lines of credit, credit cards, etc. Truly educated yourself about the different types through reading, taking classes and working with a financial advisor. The more you know, the better you’ll be at avoiding bad debt and taking advantage of good debt as needed. 10. Make a commitment to talk about debt before taking it on. Find someone in your life that you trust to help you make smart financial decisions. It could be your spouse if he or she is great with money or it could be a friend or a professional finance advisor. Make a commitment to talk about the pros and cons of debt before you take it on. This will allow you to avoid making impulsive debt decisions. 11. Avoid offers to “buy now, pay later”. This is generally a way to postpone debt and it means that the debt creeps up on your later. 12. Take a limited amount of cash with you for shopping. If you have a problem with impulse spending or over-spending then you should budget, take only a set amount of cash with you to shop and only shop when you truly need to. 13. Stay busy with work and inexpensive hobbies. If you are busy then you are not going to spend money on things that you don’t need. You’re less likely to fall into debt. 14. Save up for travel before taking a trip. You want to reap the rewards of avoiding debt rather than enjoying travel only to come home to new debt. 15. Take the lowest loan amount possible. With school loans and home loans we often take more than we actually need so we can cover the “just in case”. Calculate what you actually need and only take that amount. 16. Earn an income. There are a lot of big issues surrounding unemployment. Nevertheless, you can usually do something to earn at least a little bit of income. Earning money helps keep debt at bay. 17. Don’t try to “get rich quick”. That’s not the right income solution since it usually lands you in more debt. 18. Never gamble. If you have trouble with this one then seek assistance from a therapist trained in gambling addiction issues. 19. Make it a rule not to lend money to others. You can determine if there are exceptions to this in your own life. However, as a general rule, lending money costs you money that may or may not get returned. 20. Save smart. Open savings accounts such as CDs that offer high-interest savings. However, only do this if you are going to be able to meet the terms of such accounts without penalties. Do you still have debt that needs to be dealt with? Check out 25 basic steps for getting rid of debt. Along with #16, I would add, explore multiple income channels. @Jenna … That’s a really great point! Right now I’m very interested in passive income options that will provide a steady stream of income over time (such as writing that offers long-term royalties). @Kathryn / Cool! Thinking about writing a book in the near future? @Kathryn / WOW! Congrats! And good luck in the future. I’ve written a couple of books about the local area and do receive royalties on those. I’m currently interested in passive income for online writing but definitely want to write another book in the future. Thanks for asking!